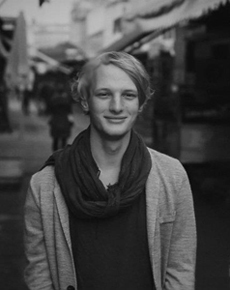 When it starts and ends with an "A"
Born in 1989 in Landshut (Bavaria / D), Andreas startet making music at the age of 15. At this time he played in several bands. After the split of Silent Poetry he concentrated on electronic-based music. In 2007 he founded the DJ/Producer collective Four Finger together with the bands former members Sebastian Oberst and Andreas Wagner (a.k.a. Einer Weniger). The following time was characterized by playing DJ-sets and organizing parties with this collective. In 2010 Andreas moved to Vienna, following his buddy Sebastian. Here Andreas shifts his focus back to practising music, with the aim to connect his electronic music experiences to instrumental based music. The first result of this will be released in the near future: "Today I Feel feat. Martin Steer" on Schönbrunner Perlen 2, a collaboration with Sebastian Oberst. Next to music, art has always been an important core theme in his life. He not only has made covers for several bands (i.e. Pandoras.box), but also uses strategies from art to get his inspiration working. In 2011 he started producing his experimental solo debut album "Ascent/Decline" within three weeks. This concept album is inspired by the South African artist William Kentridge concerning the artists specific process in making drawings. Andreas is applying his concept of fortuna to musical practise, especially acknoledging the influence of chance. The album and the whole musical spectrum of Andreas is based in a colourful mix of genres, ranging from house, IDM, field recordings, ambient, jazz and soul up to indie. But one thing you will always find in his music: Melody.